I am Kristina’s mother, Anda, and I have been tasked with discussing how to make a holiday family favorite known as “24 Hour Salad”. My recipe closely follows that in the Better Homes & Gardens New Cook Book, which is not new but about 60 years old. This salad was never a tradition in my own family growing up, as I am Latvian and nothing in this salad is at all Latvian. Talking about things Latvian belongs in another blog entirely. Maybe one with a lot of singing, folk dancing, vodka and beer. Suffice it to say, her father, also not Latvian, grew up with this “salad” featured at Thanksgiving and Christmas, and his mother Faith Cumings at one point supplied me with the cookbook. She also gave me a lot of her kitchen utensils, other cookbooks and entertaining advice over the years. My own mother and grandmothers also did a lot of cooking and entertaining, but quite different in character. I am not surprised that Kristina loves the kitchen so much, and that she married a man who is also passionate about creating great food and great parties– it seems to be in the gene pool! The first thing to know about this recipe is that it truly MUST be made a full day ahead! The 24 hour rest in the fridge before serving allows the custard to properly set; otherwise the result is runny and incohesive. Also, be advised that this is not a salad, but a dessert. This is a carnival of canned fruits and whipped cream and marshmallows, not leafy greens. 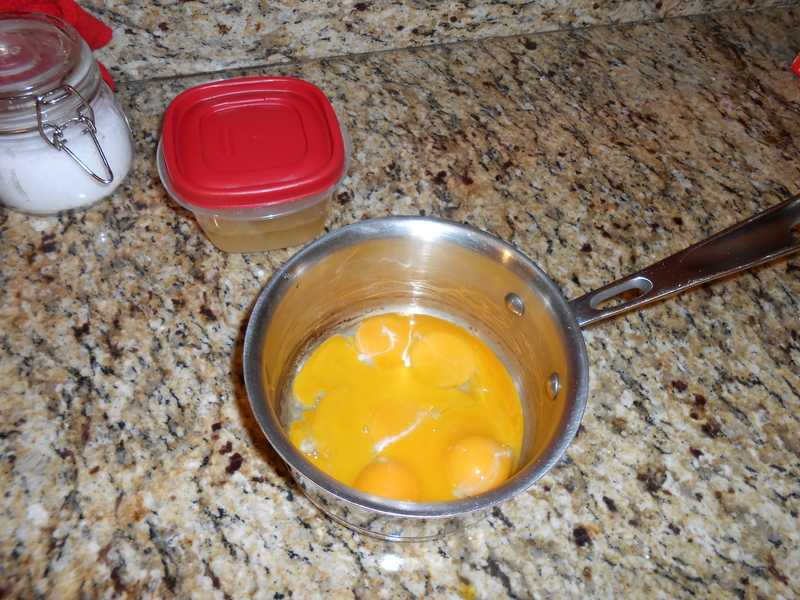 The first step is to separate 6 eggs, and to put the yolks in a small sauce pan. Save the egg whites to make meringues or a white omelet, you will not need them in this recipe. Whisk the yolks slightly. Set them aside to await more ingredients, this will eventually become a custard that is the delicious “glue” that holds this “salad” together. Next, pull out a strainer, put it in the sink and open three 1lb 4oz cans of pineapple tidbits (not crushed! ), making sure you reserve 4 tablespoons of the juice. Put the juice in the saucepan with the egg yolks. Pour the pineapple out into the strainer to drain. 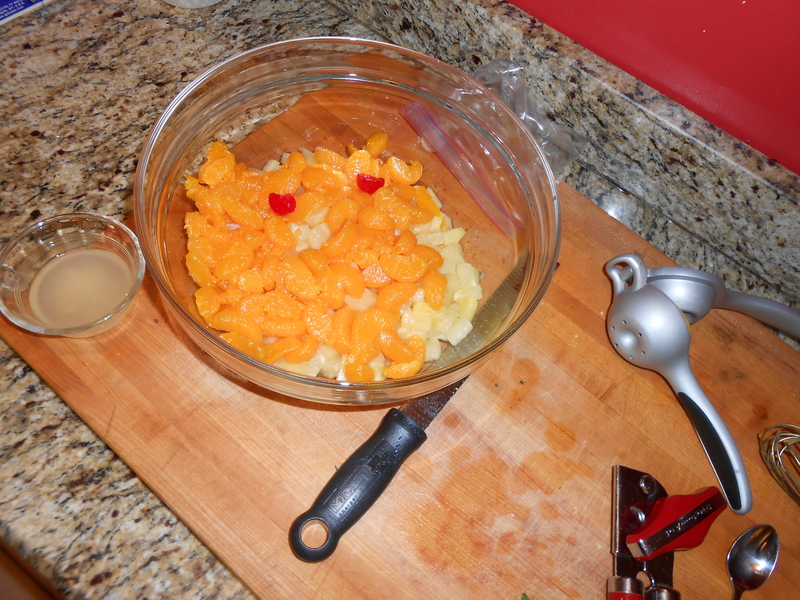 Add to it two 8.5oz cans of mandarin oranges and a 1lb jar of maraschino cherries. Cut the cherries in half with a very sharp knife if they are whole and large. Now return to the saucepan with the yolks, and add to it 4 tablespoons white vinegar, 2 tablespoons butter, 4 tablespoons sugar and a dash of salt. 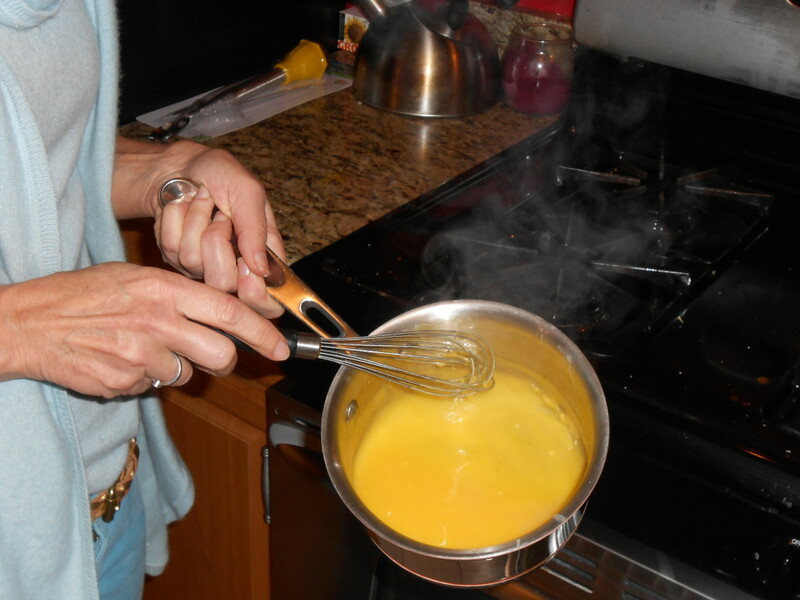 Holding the saucepan over a low heat, whisk the egg yolk mixture lightly and continuously until it starts to thicken. Then turn off the heat and allow it to cool completely. This Thanksgiving, my son- in- law Mike put the saucepan in an ice bath and the custard was cooled very quickly. In years past, as it was so cold by this time of year, and the fridge was packed with holiday food, we put the pan out on the screened- in porch, or on top of the outdoor grill (not in use!) for a quick cool down. If you are resorting to these methods, don’t forget it out there, or leave it where a possum can get it. Just a warning. Next, making sure they are well drained, put the fruits in a large serving bowl. 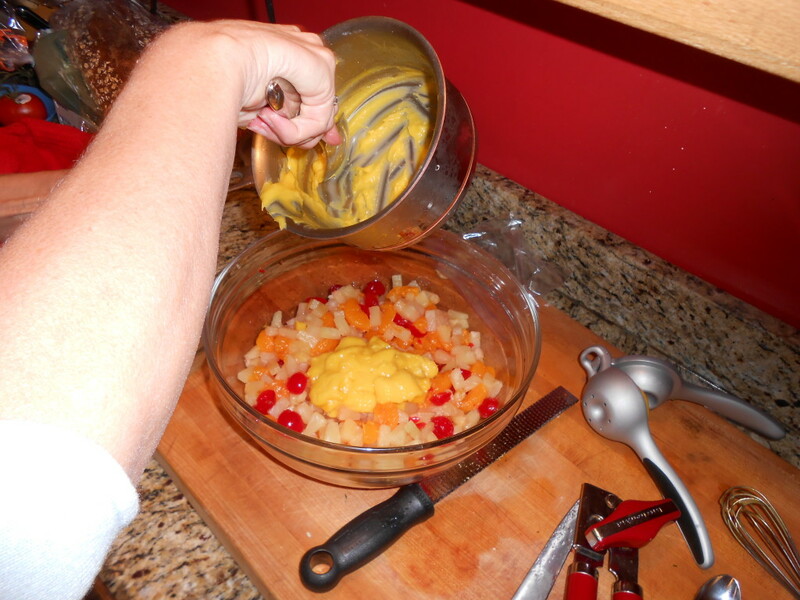 Fold the custard into it, it will barely cover the fruits and not look like much. That’s fine, it does it’s magic later. Now add 4/5 of a bag of miniature marshmallows to the fruits, once more mixing gently. Do not bruise the fruits, do not rush. Take a full pint of whipping cream, add two tablespoons of sugar, and whip it until it is stiff enough to stay in the bowl when turned upside down. Fold this around the fruits and marshmallows, and use the remaining marshmallows to make “snow” on top of the mixture, if desired. One could add some more cherries to the top, too. Cover and chill for a full 24 hours. This is a favorite for children in particular. Enjoy, and have a Happy Thanksgiving! 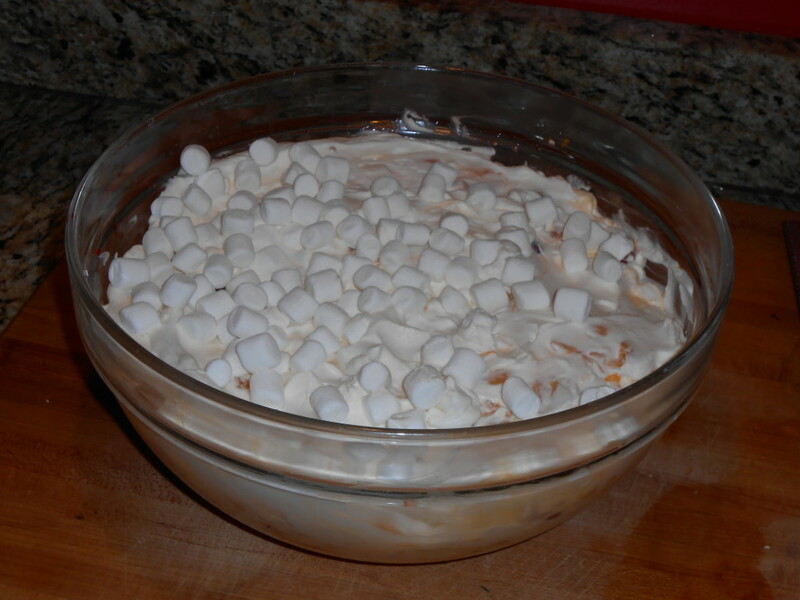 Canned fruits, custard, marshmallows and whipped cream unite in a festive concoction generously referred to as a salad. This recipe recalls the glory days of Wonder Bread, Jello, Miracle Whip and cars with fins. Drain fruits, reserve 4 tablespoons pineapple juice. In small saucepan, mix yolks, reserved juice, sugar, vinegar, butter and salt. 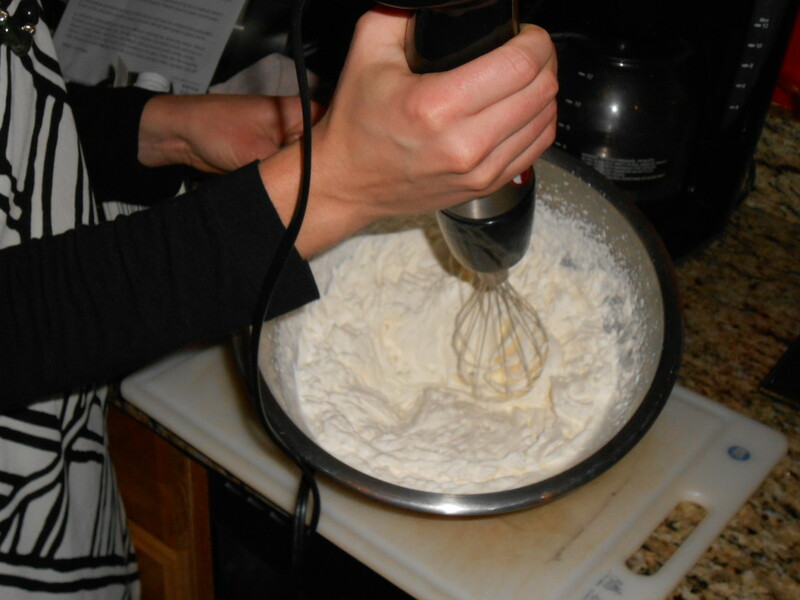 Cook over low heat whisking constantly until mixture thickens slightly, barely coating the whisk. Combine well drained fruits, marshmallows and custard, fold in whipped cream. Cover and chill for 24 hours. Serves 12 or more. Chill leftovers. This entry was posted in Cooking, Guest Posts, Recipes and tagged 24 Hour Salad, dessert, fruit, Mom, retro recipe. Bookmark the permalink. I grew up with this salad as well. Not the holidays without it. My Mom used white queen Anne cherries instead of maraschino and added about a half a cup of chopped pecans. Delicious! Thank you for posting this recipe. My Mother always made this salad for special occasions. There are a couple of exceptions…my Mother’s recipe called for Princess Ann Royal cherries and also for blanched, sliced almonds. As a child, I loved this salad. When we moved to the USA, my Mother switched to a fruit salad made with sour cream and miniature marshmallow, which is a good salad, but does not taste the same as her 24-hour salad. This year I have been asked to make the fruit salad with sour cream and marshmallow for our Family Thanksgiving dinner. I will make that salad, but I am also going to introduce the 24-hour salad my Mother made when I was a child. Wow — THANK YOU for posting this! You solved a puzzle. — While going through some of my mother’s photographs from 1960 I found a recipe for”Wedding Salad or 24-Hour Salad” tucked among the snapshots. Only the ingredients were listed (almost exactly the same as in your blog, but with half the quantities, fresh rather than canned oranges, and Royal Ann rather than Maraschino Cherries — Mom was a California girl). I could not imagine how to combine the egg yolks, vinegar, and marshmallows with the fruit. Thank you for sharing the secret in this excellent post. The step-by-step photos and reassurances about the egg-yolk mixture are also very much appreciated. I am sorry it has taken me so long to reply- but I am happy to have been of service! This “salad” has been a part of our family for decades! A natural born blogger…well done. Happy Thanksgiving to you and your family. We are all enjoying this labor of love.